A new week is a continuation of the past weeks but also a fresh opportunity to get things right or even make new and exciting choices. Each day of the week presents it’s own new and unique challenge which takes a lot of strength and prayers to overcome. Each new week, it is important that we reach out to our loved ones and friends to cheer them on and pray that they may despite the odds, go on and have a happy week. 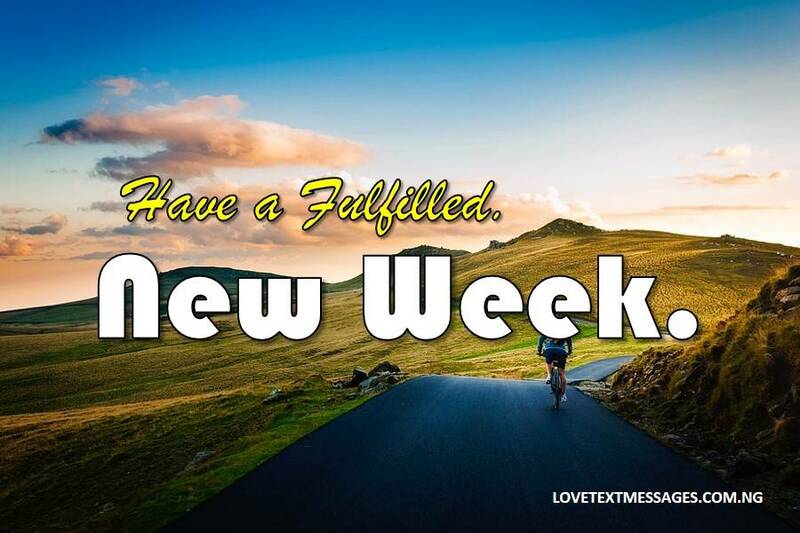 Here are some prayers and sms messages to encourage our friends and loved ones with for each new week. 1. It’s a new week honey, time to crush new goals. 2. I pray lines fall in pleasant places for you this new week. 3. I pray this new week turns out to be everything you need it to be. 4. May the Good Lord strengthen you this beautiful week. 5. Have a blessed and fruitful week Mr handsome. 6. Hey boo, continue to win in this new week. Happy new week, my love. 7. May the end of this new week be better than its beginning. 8. Prosper in all that you do this new week. xoxo. 9. keep your eyes on the prize honey, have an amazing week. 10. Receive the grace for financial exploits and breakthroughs this new week. Love you. 11. I pray you have the right motivation to get through this new week successfully. Love from your girl. 12. New week, a better you, Amen. Have a good week. It’s all love from my end. 13. May God reward all your efforts this brand new week and always. xoxo. 14. Let each day usher in bigger and better opportunities for you, Amen. Kisses. 15. Be filled with the right vibes for this new week. Your baby girl loves you. 16. The Lord shall bless the works of your hands this new week and always. I’m thinking of you all week long by the way. 17. Hey handsome, have yourself a fruitful week. 18. This is just me asking God to be with you all the days of this new week. I love you. 19. May you rise above all your challenges and gain access to God’s favour in this new week. Love Boo. 20. 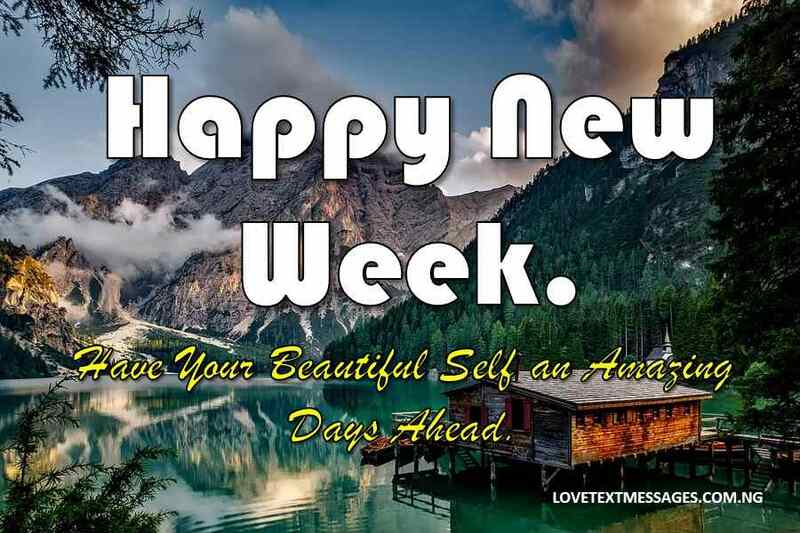 Let this new week be everything you hope for and more, happy new week darling. 1. Let this new week bring lots of laughter to your beautiful face. 2. In this new week, shine like the star you are. 3. Good vibes only for my girl this new week. Happy new week to you, my love. 4. You can do anything you put your mind to, don’t let anyone tell you any different. Have a beautiful new week. 5. Hello beauty, start this new week with a smile and end it with so much Joy. 6. You should always remember this, I’m here for you. Have a fulfilled new week. 7. May this new week be as perfect as your beautiful smile. 8. Day after day, may this new week spring forth blessings to you my love. 9. Soar on to more greatness my love. Enjoy the new week. 10. I love you more for your will to succeed. Keep flying higher love. 11. A beautiful week for the beautiful Lady. 12. Like a rose, flourish and bloom this new week. 13. Stay winning this new week, xoxo. 14. There’s no one else like you, so go out there and shine, happy new week darling. 15. Don’t ever stop believing in your beautiful self, you are amazing. Have a fun-filled week. 16. Beautiful people deserve a beautiful week, so have a beautiful new week baby girl. 17. Have your beautiful self a fabulous week. 18. I pray you find the right motivation to take on this new week. I love you. 19. Cheers to a wonderful week ahead babe. 20. I just want to wish the world’s best girlfriend an amazing new week. My love is yours all the way. 1. From a money making Monday to a fabulous Friday, I hope your week is a bundle of successes. I love you. 2. Hey, champion, it’s a new week, go out there and win big. xoxo. 3. Darling, welcome to your best week yet, have a fruitful week. 4. It’s a brand new week and an opportunity for a fresh start, have yourself a great week. 5. I can’t wait to hear all the amazing stuff this new week holds for you, I love you. 6. Step out this new week in God’s grace and Favour, Amen. 7. May this new week be filled with beautiful opportunities and better results. With love from your heart. 8. All my love, all my support, to you this new week. 9. I believe in you my darling, always, never forget that. Have a great week. 10. You are unstoppable so stay winning, have an excellent new week. 11. Forever my soul mate, have the most brilliant new week. 12. May God sustain your strength throughout this new week, Amen. 13. I appreciate all the efforts you make towards building a beautiful home with me, have a fruitful week ahead. 14. I love that you still make out time for me despite your busy work schedule. Have an awesome week. 15. May each day of this new week hold new blessings for you, my Love. 16. Your happiness is my happiness, have a happy new week. 17. I’m your biggest cheerleader, have a splendid week. 18. Continue to grow and prosper in this new week. Have a beautiful week. 19. This is me sending you all the best wishes you need for an amazing week ahead. 20. Wishing my favourite human being an amazing new week. I love you. 1. To the Queen of my heart, have an amazing new week. 2. Cheers to having a fun filled week babe. 3. You know I’m here to support you all the way, have a beautiful week dear. 4. I have not met a more hardworking woman, you are my daily inspiration, have a fruitful new week. 5. Go get that glow on, have an awesome new week. 6. Have a beautiful new week. Love, hubby. 7. May God’s Grace open new doors of favour for you this new week. 8. I don’t tell you this often; you are the source of my inspiration. Have yourself a merry new week. 9. 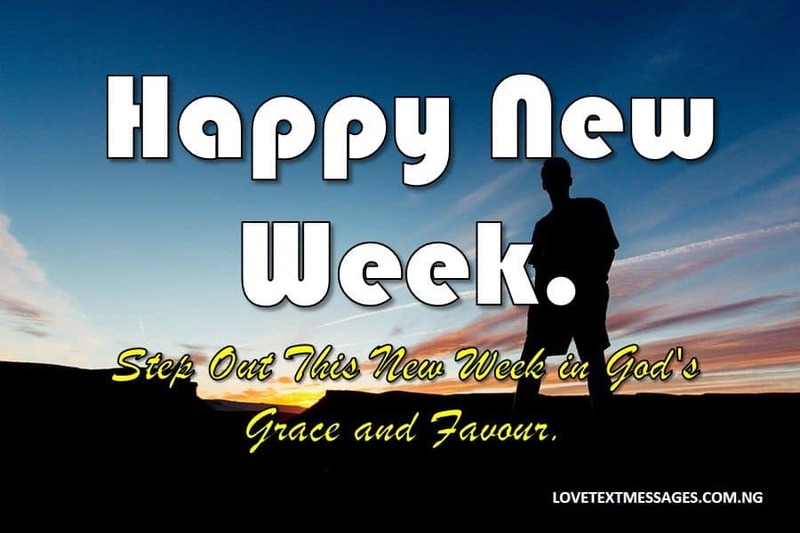 Another week is here, another week of God’s grace in your life, Amen. 10. I’m super proud of the woman you are, more Grace to your pace. have a happy new week. 11. Hey Lady Boss, Go on and have a thriving new week. 12. My life is better because you are in it, Enjoy the new week babe. 13. May this new week bring you steps closer to your dreams, Amen. Have a happy new week. 14. Have your beautiful self an amazing new week, I love you. 15. May God give you good and perfect gifts this new week. 16. To my beautiful wife and the mother of my beautiful kids, have an awesome new week. 17. Week in, week out, I’m still here supporting and praying for you. Have a beautiful new week. 18. I pray something amazingly beautiful come to you this new week. 19. An awesome new week for my special someone, xoxo. 20. Don’t ever forget, I’m your biggest fan, have a beautiful new week. I love you always. 1. Leave the disappointments of the past behind, go forth and embrace the blessings of this new week. 2. It’s a new week, may God continue to bless your efforts and Crown them with success. 3. Thank you for your beautiful friendship dear, have an awesome new week. 4. Be Intentional, keep working on your beautiful dreams, have a happy week. 5. It’s another opportunity to bring your brilliant ideas to fruition, have a fruitful week ahead. 6. May God bless your ideas, imaginations and thoughts so that you can get the best out of this new week. 7. You are worth every good thought and prayer my good friend. Have a beautiful new week. 8. I pray you encounter God’s favour wherever you go to this new week, Amen. 9. 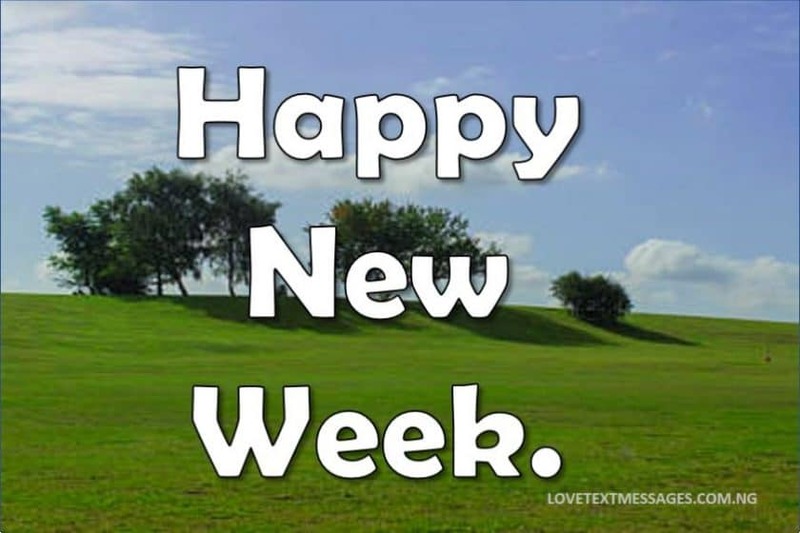 May this new week hold amazing opportunities for you and may you utilise them to your upliftment. 10. I pray you find reasons to be truly happy this new week. 11. In this new week, you shall seek and find, doors of blessings shall be opened unto you, have a great week. 12. May each day of this beautiful new week bring you lots of laughter and good companionship. 13. Smile, be happy my dear friend because God has blessed this new week for you. 14. Let God’s unlimited grace lead you through the week. Happy new week dear. 15. I’m sending you my best wishes for this new week. Have an amazing week. 16. May your hard work never be in vain, have a beautiful new week my dear. 17. You had an amazing weekend, have an even more amazing new week. 18. Another week to show the world how amazing you are. Have a great week dear. 19. Your diligence and positive vibes inspire me. Have a happy new week dear. 20. To my one in a million friend, have a brilliant and colourful new week.